I will capture the flow of Gregory’s life along with crucial highlights. 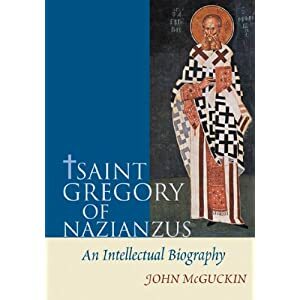 McGuckin’s thesis suggests something along the lines that Gregory “midwifed” a new Christian vision into the old imperium. Gregory opted for something like a Christian Hellenism, or rather the New Byzantine vision (I understand this language is somewhat anachronistic, since Gregory would have seen himself as a Roman). This method and vision allowed him to bring order to a then inchoate biblical theology. It was a bridge between the Hellenic and Semitic worlds. He was able to hold apparent opposites in creative tensions, and he refused to collapse mystery and symbol into logical deduction (McGuckin10). In fact, in Gregory’s hands Christology is never allowed to escape its proper context of reflection: “the dynamic mystery of the economy of God’s salvation of humankind” (390). In order to counteract Julian, Christians had to offer an inspiration for a new imperium and society (117ff). Both Gregory and Julian agreed that “a culture cannot be divorced from its religious inspiration without being fatally compromised.” In this battle Gregory forges a keen anti-Hellenic apologetics. Much of it is similar to Augustine, albeit with the promise that Christianity is able to synthesize old and new (121). Indeed, the birth of Byzantium is the new public confession of the Spirit as homoousion. Gregory’s confession of the Spirit is the positive triumph of what was best in Origen: it is the present spiritualization of the current order and the ascent to divine vision (309). Gregory is able to do what his master could not: correlate the eschatological vision with historical unfolding. Gregory’s social program is connected with his anthropology (151). Image and archetype are reconciled in the hominisation of God as a poor man. The human condition is mixis between clay and divine image. This is not merely an attack on Eunomios. It is a vision for theology (263). He attacks two theological positions: a) that the Son and Spirit are without cause (agenetos); and b) they are caused by the Father as something other (hetera) to him. principle of causality: it is something other than what is meant by God’s causing the created order. It indicates the manner in which the Father relates his being to the other two persons. They have a triadic structure to them. Or. 27 and 28 deal with theologia as our perception of God. Orations 29-30 deal with the Son’s relation to the Father. Oration 31 deal with the Spirit. The Son is generated, not from the ousia, but from the Father’s person. Otherwise, the Son, having the same essence, would generate himself! Contra Eunomius, this means ingeneracy or generation is not constitutive of the divine essence. The divine being is primarily the Father’s being, not a generic class of being (McGuckin 294 n352). The Father personally communicates this being to the hypostases of the Son and Spirit. Gregory draws from the earlier church’s vision of the triad as a single coherent process of unfolding the life of the Father. Therefore, threefoldness is just as much a principle of unity as of differentiation (296 n355). It is through the Spirit that the Father is known and the Son glorified. The idiomata do not define the essence, but are themselves defined in relation to the essence. The three stages of revelation are progressively perfected. This is a hard read. And it is not quite the same “kind” of work as McGuckin’s masterpiece on Cyril. The latter is a theological commentary; this, as the subtitle makes clear, is an intellectual biography. Still, McGuckin’s scholarship is world-class and this is easily the best biography on Gregory. Harnack had it backwards. Did the early church “Hellenize” and thus negate Gospel purity? The question defies any easy answer. We will look at a few. (1) Harnack held that the early church imported Greek concepts into the sweet biblical faith and polluted it. (1*) The Greeks imported the miraculous into the Biblical faith and ruined the message of Jesus and love. In other words, Jesus was a good German professor. Harnack is too easy to attack. Let’s look at other options. (2) Greek categories were already embedded in the New Testament. (~2) There is no systematic Hellenization in the New Testament. Now for my view, which I got from John McGuckin and John Zizioulas. (3) Immediately after the Constantinian settlement Gregory of Nazianzus posited a new vision of the Roman Imperium, now Christian, as the new intellectual logos (using logos as rational order, not as Jesus). (~3) Should we not go back to the Bible? The objection implies a going back to the Hebrew ontology, such as it is. Of course, we should always go back to the prophets, who offered their own social order. But as to going back to a Hebraic intellectual system, the problem is what is meant by it. (~3′) What is this Hebraic logos? I suggest, however, we say with the apostle Paul, “The cross is foolishness to the Greeks and a Stumbling block to the Jews.” Therefore, we see Paul rejecting both (2) and (~3). Paul rejects Hellenization and it is doubtful he would be thrilled with reading Aristotle back into the NT.